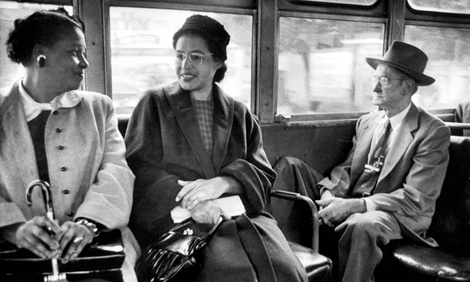 Rosa Parks (center) rode on a newly-integrated bus in Montgomery, Alabama, after she helped change unfair laws. On December 1, 1955, Rosa Parks showed great courage. She was seated in the middle section of a bus on her way home in Montgomery, Alabama. When the bus began to fill up, the driver asked her to give up her seat for a white passenger and move to the back of the bus. She refused, and the driver called the police. Parks was arrested. At that time, laws in parts of the southern United States discriminated against African Americans. One of these laws said that African Americans had to sit in the back of public buses. They could sit in the middle section only if the seats were not needed for white passengers. Parks thought that these laws were unfair, and she wanted to help change them. Her courageous actions led to a bus boycott in Montgomery. Bus boycotts and other protests led to some unfair laws being changed. Because of the work Rosa Parks did in the 1950s, she has been a longtime hero of the Civil Rights movement. She continued to work for the Civil Rights movement until she died in 2005 at the age of 92. This year, February 4 would have been Rosa Parks’s 100th birthday. Special events are taking place to celebrate her important legacy. The Henry Ford Museum in Dearborn, Michigan, is celebrating Rosa Parks’s 100th birthday as a National Day of Courage. The bus that Parks made her stand on is on permanent display at the museum. At the event, Civil Rights workers and others will speak about the important work she did. The speeches will be streamed live on the Internet so that students and teachers in classrooms all over the world can listen. The museum is also encouraging people to wear a badge of courage on February 4 that they can print from the museum’s website or share digitally on social media sites. On the badge, people can write what they would like to do to bring about positive change. Other events are also being held to celebrate Parks’s centennial. The Charles H. Wright Museum of African American History in Detroit, Michigan, will be unveiling a United States postage stamp to honor her legacy. In Columbus, Ohio, the Columbus Jazz Orchestra will hold a concert called “Suite Rosa” to celebrate her legacy. On February 27, a statue of Rosa Parks was placed in the National Statuary Hall in the Capitol Building in Washington, D.C. This statue of Parks is the first statue of an African American woman placed there. Read a biography of Rosa Parks and watch a video mini-biography of her life. Find out more about the Cleveland Avenue bus in which Rosa Parks refused to give up her seat. Learn more about the National Day of Courage. You can download a badge to show how you stand up for positive change. View the U.S. Postal Service’s new Rosa Parks Forever postage stamp. How did Rosa Parks help change unfair laws? What is one way people are celebrating Rosa Parks’s 100th birthday?